The Kwantlen Student Association in Surrey is getting closer to finding the most interesting student on campus. The KSA, in partnership with Dos Equis, Travel Cuts and Contiki Holidays, is giving away a trip to London, England to the most interesting student on campus. The contest is a take on Dos Equisâ€™ series of Most Interesting Man in the World ads, which feature a daring, sophisticated older gentleman with a taste for Dos Equis. â€œThe Dos Equis commercials have been very successful,â€ said KSA commercial services manager Catherine Wilkinson. The KSA is taking advantage of the adsâ€™ popularity to promote not only student involvement, but also the sale of alcohol at the Grassroots Cafe at the Surrey campus. Five finalists have been randomly selected from earlier contest entries. They have until the end of the month to campaign for votes and convince students that they are more interesting than their four competitors. Students can vote for their favourite finalist by buying Dos Equis beer at the Grassroots Cafe and filling out a ballot that comes with their beverage. Whoever receives the most votes wins the trip, which includes two nights accommodation, a $400 voucher on flights with Air Transat, a bus sightseeing tour, tickets to a London theatre show and discount cards for attractions. â€œIn addition to all of that, people will get to know that the Grassroots Cafe is a place that you can actually buy alcohol,â€ said Wilkinson. The contest is only held on the Surrey campus because itâ€™s the only one that sells beer. Wilkinson said the KSA is working on more events with alcohol at other campuses. When she considered attending Kwantlen, Merrilee Foster thought about her two kids, six-year-old Karsten and 12-year-old Kayla. She thought about her two jobs. She thought about the burden of paying back student loans. She knew there would be sacrifices â€“ but she knew she had the ability to help people. The 39-year-old single mom took the plunge and applied for Kwantlenâ€™s home support resident care attendant program. She chose that program because, four-and-a-half years ago, Foster learned that her mother had cancer and took care of her at home. â€œI didnâ€™t have any training, but, of course, itâ€™s your parent and thatâ€™s what you do,â€ she said. Foster called a government official in Victoria for help completing an application for a health care bursary. â€œShe walked me through it and reassured me, so I could sleep at night,â€ recalled Foster. Weeks later, she received a letter in the mail saying that funding had been eliminated. The B.C. government eliminated $16 million in student aid this summer. There was no official announcement and word only reached the public on July 22, when a leaked document listed the programs that were to be immediately and quietly cut. They were the Permanent Disabilities Benefits Program, the Debt Reduction in Repayment Program, the B.C. Loan Reduction for Residential Care Aide and Home Support Worker Program, the Health Care Bursary and the Premierâ€™s Excellence Award Program. Funding for the Nurses Education Bursary was reduced. Fehr said 25 per cent of full-time Kwantlen students depend on some form of student aid. Because Kwantlen has a large nursing program, the university will be hit harder by the cuts than most schools. Fehr is already seeing the impact at the KSA office in Surrey, where students are telling her they donâ€™t know when theyâ€™ll have time to complete homework because of the need to work. She expects to see more stressed-out students than usual this year because of financial hardship. Foster, who still has to account for groceries, her mortgage and the usual mom-related expenses, decided she would tighten her belt and manage, because she wants badly enough to do the course. She refuses to worry about finances because â€œIf I start worrying about it now, Iâ€™ll be consumed by it.â€ But sheâ€™s worried about the future of B.C. health care. Foster said B.C. residents will continue to need health care, but there may not be enough workers, or the workers wonâ€™t be as qualified. Interior Design students look to stand out from the crowd. 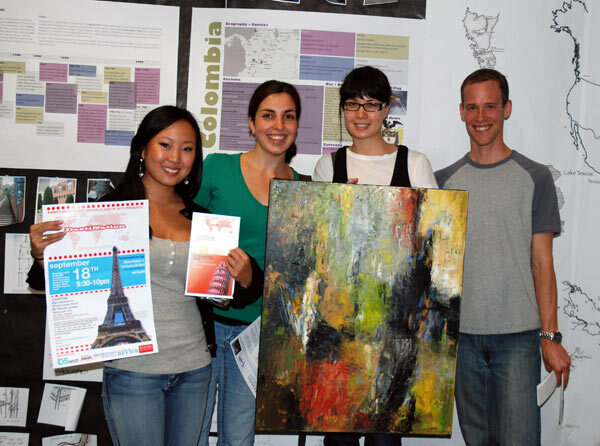 (From left to right) Third-year Interior Design students Whitney Chow, Anni Mergeran, Beatrice Muschol and Lucas Nightingale show off their advertising and an oil painting that will be featured as part of their silent auction at IDSwest. 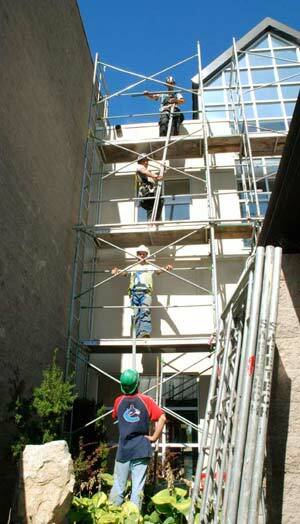 “It’s exciting,” says Beatrice Mushill, a third-year student of Kwantlen’s Interior Design program. Mushil and 10 other members of her program will be on hand Friday night at the IDSwest Trade Show in an attempt to raise the remainder of funds needed to finance a trip abroad. The group’s presentation, DestiNation, will be their second fundraiser for a trip Mushil describes as “a full seven to 12 days of sketching 24/7 , learning about architeture, design, culture and the differences of culture.”Â Though the decision about where to go hasn’t been made yet, Mushil said Spain, France or Ecuador are all being considered. In order to get there, the group is selling tickets for IDSwest for $40, or $20 if you’re a student. The ticket covers access to the show for the evening, free hors d’oeuvres, a student project display and a live performance by musician Sharon Bryson and guests. There will also ve a silent auction of an oil painting supplied by local artist Pamela Hunt. IDSwest was launched in 2004 and describes itself as Western Canada’s premiere design event, with over 200 exhibitors displaying different products and services to designers, industry professionals and consumers. Tonight will mark the opening of the three-and-a-half-day show, which takes place at Monk’s McQueen, 601 Stamps Landing in Vancouver. For further information, visit their website atÂ www.idswest.com and if you want to pick up tickets, you can email Destination_fundraiser@live.com or call Amber at 778-928-3672.